Napried Exploration was formed to locate the shipwreck site of the sailing vessel Napried, recover its cargo of Cypriot antiquities, and return the antiquities to Cyprus. Napried was a bark rigged merchant sailing vessel. In June 1872 Napried departed <?xml:namespace prefix = st1 ns = "urn:schemas-microsoft-com:office:smarttags" />Beirut bound for Boston. Its cargo of rags caught fire and the vessel burned and sank somewhere off the coast. In addition to the rags, Napried carried a shipment of Cypriot antiquities sent by Luigi Palma di Cesnola, the American consul to Cyprus. Luigi Palma di Cesnola was an extremely colorful character. He was born in Italy in 1832. He joined the Italian army at the age of 15 and by 17 was a lieutenant. He came to the United States around 1860 and fought as a cavalry officer on the Union side in the Civil War. After several successful campaigns and not a little controversy he was captured and spent time in a series of Southern prisons. After the war he had a private audience with President Abraham Lincoln not long before Lincoln was assassinated, and after that Cesnola claimed that Lincoln had promoted him to General, a title that he used from then on. Cesnola was ambitious and arranged for an appointment as consul to Cyprus. Once on the island he learned about the excavation of ancient sites on the island by the consuls from several other countries and he eventually became involved in the activity in a big way himself. Over time he amassed a collection of antiquities comprising approximately 35,000 pieces. (About 5,000 of these were lost on Napried.) He negotiated with several museums around the world for the purchase of the collection, and eventually sold the bulk of it to the newly formed Metropolitan Museum of Art in New York. Cesnola became the first Director of the Met and served in that position until his death. 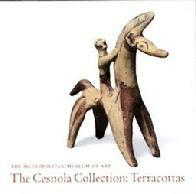 The 'Cesnola Collection' remains an important holding of the Met to this day. Much of what was considered 'archaeology' in the mid-19th century is now considered looting. The excavation of sites, including Cesnola's work, amounted to little more than digging for goodies, with little of the documentation that would be considered essential by today's standards. Excavation was done by foreigners and the best artifacts were often removed from the country (such as the famous Elgin marbles from the Parthenon). Even if the Napried proves to be in international waters, Napried Exploration believes that the best disposition of the artifacts would be to return them to the country from which they were removed. If you are interested in further communication about Napried Exploration please send e-mail to napried@napried.com.